In Blog, FINKELSTEIN V.VULTURE LAWYERS: ALL UPDATES, News. I write to protest the treatment of Dr. Norman Finkelstein who was arrested after exercising his Constitutional right to protest unethical behavior by a pair of corrupt Mineola lawyers, Michael Chetkof and Allyson Burger. Dr. Finkelstein, 64-years-old son of Holocaust survivors, is a Professor emeritus of Political science and worldwide-renowned Writer and Speaker. Dr Rudolph Baldeo, a former student of Dr. Finkelstein’s, had fallen prey to their misconduct which included extreme psychological pressure, slanderous accusations, perjury and blackmail during his divorce. By these means they succeeded in leaving him completely ruined and broken (see here for more details: http://normanfinkelstein.com/2017/10/12/mens-rights-matter-systemic-corruption-in-the-divorce-industry/). In an effort to help, Dr. Finkelstein put the two lawyers on a Listserv mailing list with the option to unsubscribe themselves if they so wished – this option to unsubscribe is standard procedure for letter-writing campaigns as a safeguard against claims of harassment. He followed up a month later by peacefully passing out leaflets outside their offices on September 6th 2017. On that day he was arrested for the first time at 11.15 PM on charges related to the letter-writing. He was arrested again on 9th October at 11.18PM, the very night before he was to appear in court. The video in which Dr. Finkelstein describes his maltreatment cannot fail to shock you (https://www.youtube.com/watch?v=uzaCdY2HTsE&). On the first occasion he was driven in handcuffs for an hour from Ocean Parkway to Hempstead. He then spent five hours handcuffed to a pole. He spent the night on the concrete after he was refused a blanket. On the second he was abducted beginning 11.18 PM, led out of his apartment in boxer shorts and physically abused. This was followed by an involuntary psychiatric examination (where the Orwellian police officers that had arrested him claimed that him being out at night almost naked should prove his insanity!…) after which he was literally thrown in to a vehicle and driven back to the cells – a tactic the Government of Uganda uses against opponents. He was held for eighteen hours. Looking at your official website, I see you hold yourself out as an official whose focus is on “massive in-depth probes and take-downs of corrupted government officials and their associates” in order to end corruption in Nassau County. Chief Judge Janet DiFiore had enough confidence in you to appoint you to the New York State Justice Task Force to tackle “attorney misconduct [and] wrongful conviction safeguards”. This clear case of attorney misconduct coupled with the police misconduct flies in the face of your stated mission and demands you carry out a probe in to the unlawful arrest of Dr. Finkelstein and take the necessary action to eradicate the obvious corruption involved. 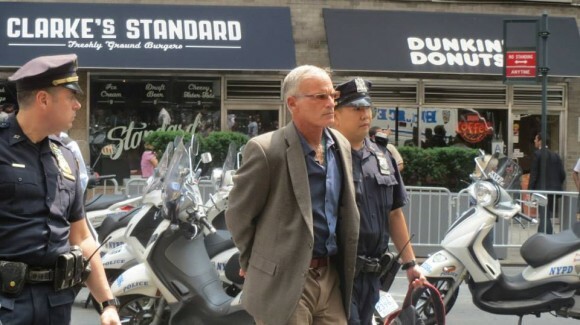 Ecrivez au District Attorney (Procureur de la République) du Comté de Nassau pour protester contre les deux arrestations arbitraires et violentes de Norman Finkelstein en pleine nuit, les 7 septembre et 9 octobre 2017, ou téléphonez-lui au +1 516-571-2100.